Only Crestron provides end-to-end control solutions engineered from the ground up to deliver truly integrated home technology. By making products specifically designed to work together, we’ve eliminated the challenges of connecting a mix of disparate products from multiple vendors. The truly integrated home is now a reality. The result is one seamless, worry-free system that delivers an incredible user experience. For more than 40 years, we’ve provided revolutionary products and solutions that shape the living experience of the modern home. There’s no better reward you can give your family, no better upgrade you can give your home. 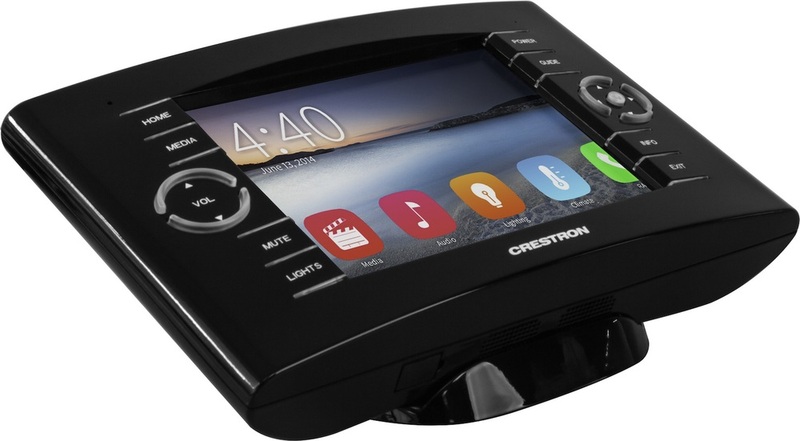 Explore the world of Crestron Integrated Home Technology. More than a place to prepare food, today’s modern kitchen serves as the ultimate gathering place. With Crestron, you can bring the conveniences of the rest of the home into your kitchen without the clutter. Check the weather, sports scores, or a recipe on the Internet while cooking dinner. Shut off lights, view security cameras, and adjust the temperature in other rooms while watching your favorite TV show or Blu-rayTM movie. Whether reading a book on a rainy day, enjoying a romantic evening, hosting a gathering with friends, or just hanging out in front of the TV, you live in your living room. Crestron home technology can be artfully blended into any interior design and lifestyle. You get seamless technology you can easily live with - one touch control of your entire home. Entertain and create the perfect ambiance with just a tap. From your choice of discreet designer keypads, adjust light dimming and shades. While you’re there, select and listen to your favorite music - CD, iTunes®, even Pandora® - in every room from our high-energy in-ceiling speakers. At the end of a long day, settle into the comfort of your bed and let all your stress melt away. Control more than just the TV from a handheld remote. Select “goodnight” to turn off all the lights in the house, turn on the camera outside the front door and adjust the nightlight for the kids. You can even make sure that all the shades are drawn and the temperature is set back without getting out of bed. Once your Crestron system is complete, Pyng makes it easy and fun to personalize any scene or setting to make your smart home even more comfortable, convenient, and luxurious. All of your settings are backed up in the cloud so you can make changes with total confidence. Saving energy involves more than simply harvesting daylight and dimming lighting levels. Lighting and shade control is only a small piece of managing your home’s energy usage. Lighting accounts for about 20% of your home’s electric bill. What about the other 80 percent?